Very Wide Field. Imaging Missions. Typically used for RGB & Narrowband Imaging. T8 is a 106mm Takahashi FSQ telescope based at SSO in Australia. It has a selection of RGB and Narrowband imaging filters. Its teamed with a sensitive FLI Microline CCD and a full house filter wheel. T8 is a prime imaging platform in the southern hemisphere with exceptional optics and will be able to gather data of APOD winning quality. 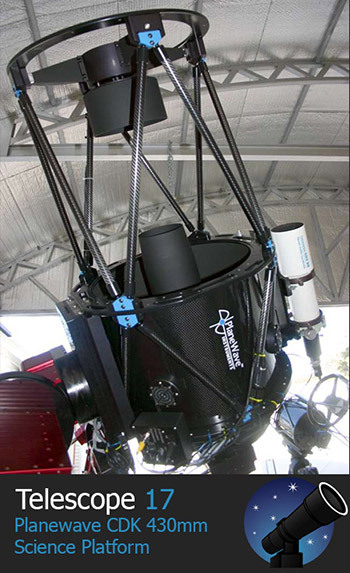 T9 is a wide-field imaging system dedicated to the astro-imager. The flat-field, fast focal ratio, and short focal length of the NP127fli is a perfect match for the large CCD chip in it's FLI ProLine PL16803 camera. This Tele Vue telescope has superb optics. Together they produce over a 3° field of beautifully sharp stars. Very Wide Field Telescope. Typically used for Wide Field RGB / Narrowband Imaging. FITS and TIF file formats. Dark Frame calibration data is available for 60, 120, 180, 300, 600, 900 second exposures. Binx1 - Binx2. T12 features a high quality Grade 1 FLI CCD. Its Internal Off Axis (MOAG) guidance system can provide high accuracy during even long exposures. Note: T30 is fitted with a very sensitive Non Anti Blooming Gate (NABG) CCD. Beware of long exposures on moderate to bright stars or targets and use a bracket of short exposures or use software to repair any blooming artifacts. T31 is fitted with a 0.66 Focal reducer. FITS and TIF file formats. Dark Frame calibration data is available for 60, 120, 180, 300 & 600 second exposures. Binx1 - Binx2. ABG. Recommended Maximum Exposure 300 secs. 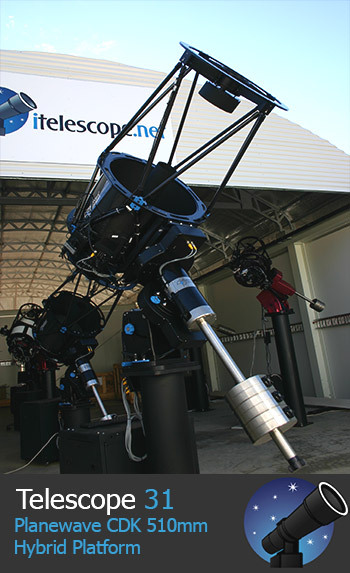 T33 features a large format Apogee CCD camera and superb RCOS optics. 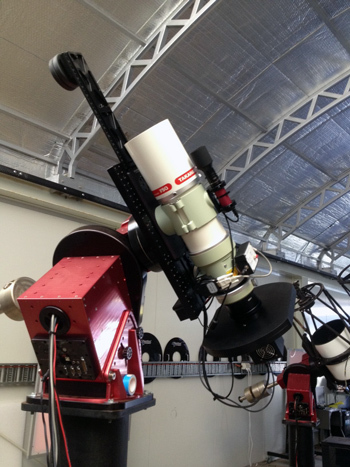 Matched up with a wonderful Paramount PME mount this telescope can deliver incredible results. Thanks to its long focal length optical design, this Deep Space telescope can deliver amazing images of small, narrow field targets such as Planetary Nebula and Galaxies. T33 is an f/9 telescope and will reward those that allow it to stretch out above SSO.